1. In a relaxed and content state more than anyone else. "Sean, what are you up to today?" "Homebrewing a batch of beer and chiillindamos." This is my homebrew blog of adventures, recipes, equipment, triumphs, and tribulations. Michelle and I just returned from a wedding trip to Pennsylvania. 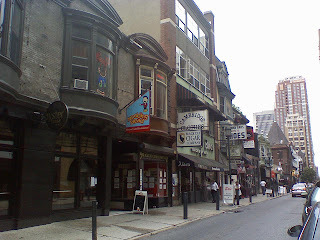 We had Saturday to explore downtown Philadelphia and while Michelle had a worth while mission to experience Dunkin' Donuts and see the Liberty Bell, I needed to find numerous opportunities to chillindamos. We left our hotel and traveled to the city via the SEPTA (local train) and practically tripped over Dunkin' Donuts, check. With a Dunkaccino and donut in hand, we headed to Monk's Cafe. 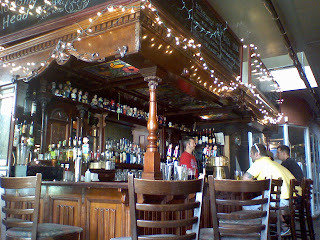 Monk's (pictured above) has two bars, one in the front and one in the rear, each with their own dining area. At the table, there's a beer bible that tells the story of Monk's and their famed owner, Tom Peters, who currently is an Ambassadeur to Orval. The bible discusses beer, the brewing process, and most importantly, the bottle list. A supplement card lists their current draughts. One could spend ages here drinking! I started out with a Chouffe Houblon which was described as a cross between a Belgian triple and an American IPA. This was a good descriptor but being from San Diego, I felt it was more on the pale ale side. The Houblon was an easy drinker. Michelle started with an Allagash White which is always a good choice. Michelle and I aren't into the cow so a Philly Cheese steak wasn't something we desired while in town. Instead, Monk's had an awesome vegan substitute that was awesome grub. The rest of the menu looked awesome as well. I then had a La Rulles Estivalle which has a blond ale using Orval yeast and three American hops: Amarillo, Cascade, and Warrior. Another easy drinker with a light body, a lager-like smoothness with citrus notes and slightly sour. Michelle had a Unibroue Ephemere which was similar to a summer wheat ale but green apple infused (not a cider). She really liked this one and it felt like a great summer brew. After Monk's, we headed over to Nodding Head Brewery and Restaurant. Above you can see the outside of the brewery. Nodding Head refers to their collection of bobbleheads, even having their own bobblehead as tap handles. They have seven tanks and thus seven beers on tap. The atmosphere was very casual. Above is the bar at Nodding Head Brewery. I first had their BPA or Bill Payer Ale which was a nice medium bodied malty pale ale. It had a citrusy smooth hop character with caramel flavor in the malt profile, copper in color, and a dense head. Michelle had their Monkey Knife Fight which was a gold lager spiced with ginger and lemongrass, yet another refreshing summer brew. Last, we had a taster of their Berliner Weiss where Nodding Head adds a bit of Woodruff syrup to cut down the sourness. Later that rainy evening, we returned to a vegetarian Chinese restaurant a couple of doors down from Nodding Head called Su Xing (pronounced SuShing and not Suking!). Good eats! 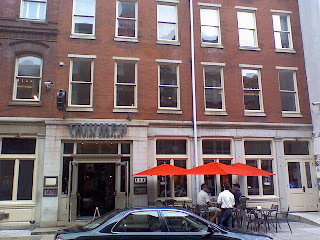 After wandering our way to Independence Hall and the Liberty Bell (check), we found Triumph Brewing Company. With a focus on German beers, this place reminds me of Gordon Biersch in San Diego. Their tap towers and faucets were awesome and seeing that they had an altbier, I had to have one. I insisted Michelle try the helles. The Sticke Altbier was not exactly what I would expect from an altbier. I then read their description and found out that sticke in German means secret. To me, the secret was something happened that imparted astringency to the beer. Bummer. The helles, on the other hand, was right on. Light and delicate malt flavors with a creamy head, this beer seemed to be the 2nd most popular beer pouring. The most popular was their Kinder Pils, a lighter version of a pilsner. Wait, isn't that a helles then!? I also had the Munich Dunkel which was really good. It was malty sweet with a medium-light body and subtle hop flavor. While at Triumph, the thunder rolled in and the sky started dumping. This slowed us a down to a near halt and we were soon jumping puddles to dinner. 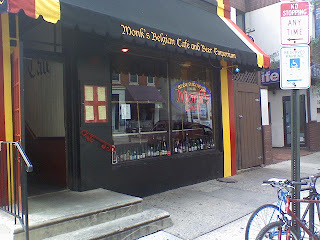 I think we only scratched the surface on our short trip to Philly and hope we make it back someday, at least to visit Monk's if anything else! Make a comment already. While waiting for your comment to be moderated, have a homebrew! Homebrewer and Master Relaxer, engaging in the art of brewing beer and exploring the flavor and life of well-crafted inebriants.